Chicago Vacuum Casting has partnered with several companies to produce high quality investment casts. Often these companies have turned to us to help reduce material and labor costs, while producing a quality part. Below are a few examples of casts we have produced for our customers. 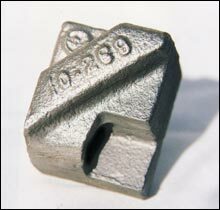 These two-iron parts were produced using the sand-casting process. Several secondary machining operations were required to properly fit carbide drilling inserts into the internal detail of the parts. Notice the rough finish and lack of detail. Chicago Vacuum Casting reduced the machining operation cost for these two parts by using the investment casting process. These parts were cast to net shape, eliminating all machining operations. 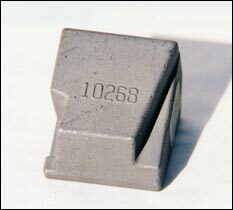 Cast from high strength steel alloy, these parts now have superior detail - see the detail in the part number. Chicago Vacuum Casting can also give your designs freedom when producing precision small parts. This example has twelve .020 diameter holes at the top of the part. 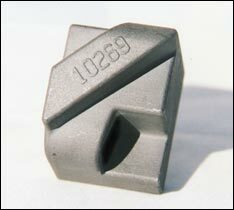 We were able to accomplish the very fine detail through the investment casting process.